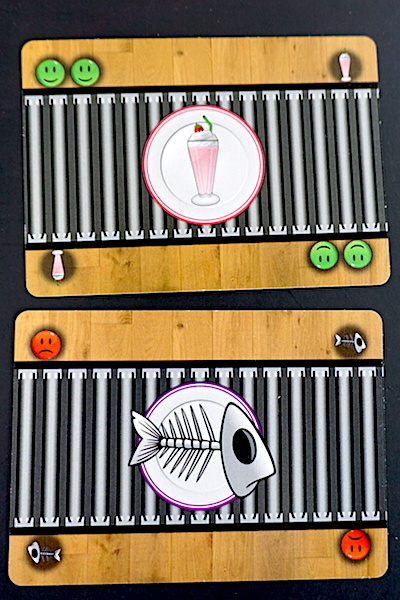 In Robo Diner, a hidden movement card game by Jan Gonzalez, you play as one of four robot waiters gathering food to bring to the diner’s customers. But will you be able to gather the food combination your customers need? If not, maybe you can at least trip up your fellow waiter-bots! 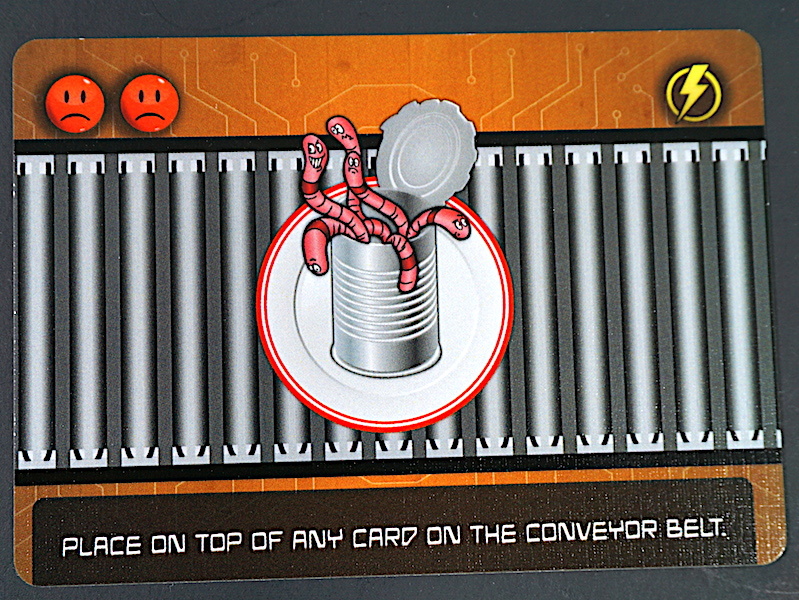 The central metaphor of Robo Diner is the “conveyor belt”, which moves randomly-selected food cards from the draw pile past the robot waiters. Up to four players set their robot cards in front of the “conveyor belt”, with an additional 2-3 cards visible at the supply end. At the beginning of a round, each player secretly chooses a card to “move belt” or “don’t move”. Once all players have selected, the cards are revealed. For each “move”, the food on the conveyor belt is moved forward one slot. This may end up dumping some food cards into the trash. Drillbit (green) chose “move”; the other 3 robots chose “don’t move”. The belt will move each food card left one space. The drink+burger card will fall into the trash. Then each player may play one or more power cards. Swap food cards, swap robot positions, or exchange a mistake card for a positive point value. Maybe you want to add a can of worms to a food card, or prevent anyone else from playing power cards this round. Once all players have played power cards or passed, players collect the food card(s) now in front of their robot (whether positive or negative). The remaining food cards slide down to fill all the available spaces. Get a bonus if you can fill this order using only one card. Maybe you should have rescued that drink+burger card from the trash. Once the food has been collected for the round, each player checks to see if they can fill an order. If so, they claim that order and set it aside, along with all the food cards used to complete it. They may also grab a bonus token (worth 1-2 points) if they fulfilled the bonus condition pictured on the order. Refill the “table” with a new customer order, and see if the next player can complete an order, too! The end game is triggered when the food deck runs out. 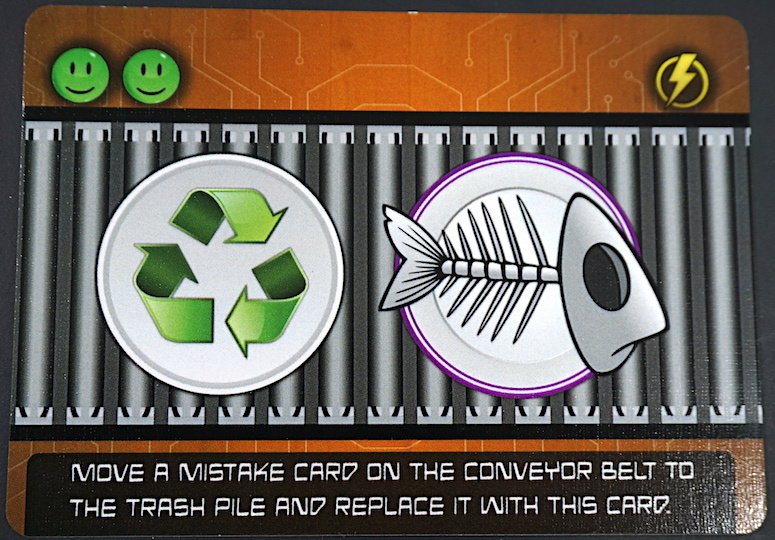 Shuffle the trash pile to become the new food deck, and players have two last rounds to fill any more orders. 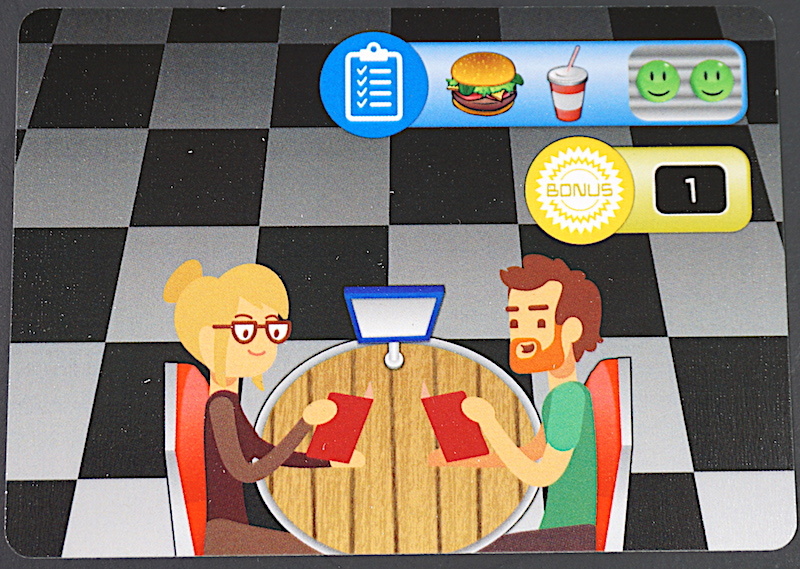 Each player adds up their points: Filled orders (with their food cards), unused food cards, and bonuses give the players positive points, depicted as green smiley faces. Mistake (trash) cards and the can of worms subtract points (depicted as red frowning faces). The player with the most points is the most successful robot waiter, whose model will go into mass-production. Robo Diner feels like a “restaurant dash” video game without the time pressure. The tension does mount as players fight to fulfill orders first. The conveyor belt idea is fun, and everyone has a hand in moving it (or not moving it) each round. It’s nice to see a take-that mechanism that slows down other players without necessarily attacking them. Instead, you’re constantly competing for the right food, and sometimes stealing it outright. There’s certainly an incentive to slow down your opponents as much as possible. The perceived randomness of the conveyor belt and action cards can lead to chaos, and your plans need to be very flexible to allow for changes. In two-player play, it gets more cutthroat. Any card you play to benefit yourself will directly impact the other player, and animosity can grow over the course of the game. Unfortunately, our family consumed Robo Diner like a plate of unsalted fries; filling but unsatisfying. Our kids did not enjoy it. This is partially because take-that games don’t always fare well in our family. But the random, chaotic aspect combined with the need for planning became very frustrating for them. For a card game, it felt like there was a lot of moving pieces. You’re keeping track of four different kinds of cards that affect your play (food, orders, power cards, and move/don’t move), while also trying to predict what your opponents will do. There is a lot of random chance, and we’ve played games where all players endured several rounds unable to find the food needed to fill the available orders. We could seed the order deck to ensure the first 4-6 cards are more easily achievable. We’d still recommend Robo Diner to some families. It’s a light take-that game that encourages planning and flexibility, and the theme is cute. Robo Diner is currently published on demand via The Game Crafter and is available at robo-diner.com. At around $30, the price is a little steep, but it fills an interesting niche in family games. 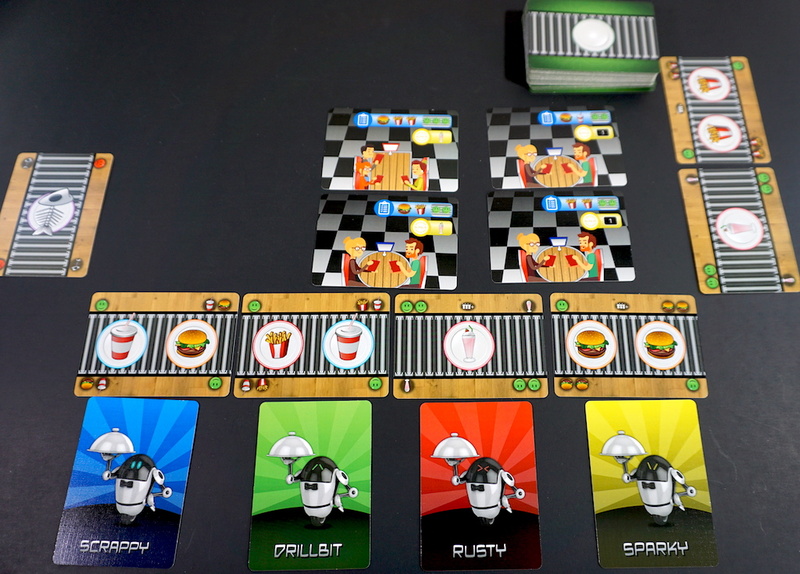 The Family Gamers received a complimentary copy of Robo Diner from Jan Gonzalez for this review.